Portland, Oregon, the big “little” city on the west coast whose motto is to “Keep Portland Weird.” Portland is a haven for foodies, outdoor enthusiasts, dog lovers, beer brewers, musicians, coffee connoisseurs, and tiny house builders and enthusiasts. It is a fantastic place to come for a day trip, but don’t be surprised if you find yourself spending a few days in the City of Roses. 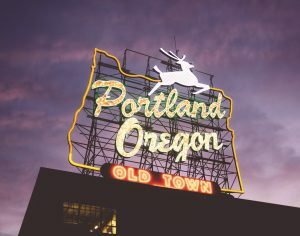 Portland is a place where the counterculture is the mainstream and its citizens work hard to keep it “weird.” We’ve rounded up just a few essential places, restaurants, and activities that anyone visiting Portland can enjoy! Start your excursion off by grabbing a coffee at one of Portland’s many independently owned coffee shops. Portlanders take their coffee very seriously and the people who work in this industry are experts in their craft. Ever wonder what “Chemex” means? Or what the “steampunk method” is? Or the best way to make a perfect pot of French press? The Third Wave Coffee Tours is a great way to get introduced to the thriving artisan coffee scene. Their walking tours bring guests to four or five different coffee shops within one neighborhood of Portland. Snacks are provided along the way and guests sip on excellent samples of coffee while learning all about how different shops roast and serve their coffee. To make a tour reservation, visit thirdwavecoffeetours.com. If you’re in the mood to just enjoy a cup and bask in the coffee-shop dwelling tradition here, then we recommend checking out The Albina Coffee Press for an excellent cup of french press coffee on Hawthorne Blvd or Fresh Pot, which has a location at the Powell’s Bookstore on Hawthorne Blvd and a location on historic Mississippi Avenue. After you’ve got a caffeine boost, head out to one of Portland’s many lush parks. On the Southeast side is Mt. Tabor Park. A now dormant volcano, Mt. Tabor is one of the finest parks in the city for it’s beautiful summit views of Mt. Hood on one side and Mt. Saint Helen’s on the other. Enter the park at the 60th street entrance off of Hawthorne Blvd or on the other side at Harrison and 72nd Street. Or, head out to the northwest side of the city, where the largest urban forest in the United States, Forest Park, is situated. At 5,157 acres, there are a plethora of trails to explore. We recommend taking BPA Road, a gentle 2 mile round trip path that enters at NW Skyline Blvd. Along the path, you’ll have views of the Willamette River below and vista views of Mt. St. Helens and Mt. Rainier out in front of you. On your way back to the city, head to one of the many food cart pods. Located on SW 10th and Alder Streets are the Alder Street Food Carts, the most famous and largest food cart pod in the city. 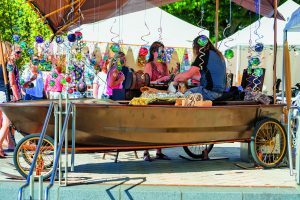 This pod has a number of well-loved food carts from almost every kind of cuisine. Even your gluten-free/vegan/paleo/other friends will enjoy the large number of options here. We suggest checking out Nong’s Khao Man Gai, still one of the most popular carts, which serves up a traditional thai chicken and rice dish that is out of this world tasty! Other notable food cart pods include “TidBits” on SE Division Street, which has a beer garden and outdoor heaters for all-weather outdoor dining, or the Carts on Foster on SE Foster, which has carts for everything from pastries, to egg sandwiches, to fried fish, and even a 24 hour hair salon that runs out of an RV. Not too far from Alder Street on NW Everett Street in Chinatown is the Lan Su Chinese Garden. Walk through this traditional Chinese garden that is a zen paradise sitting in the middle of the heart of downtown Portland. Take a stroll through this intricate and beautiful garden and stop into the onsite traditional Chinese tea house or view the traditional Chinese watercolors, some of which are for sale. Also in the Chinatown area, is the Red Robe Tea House. The menu has a variety of tasty dumplings, noodles, and a wide variety of Chinese teas to sample. If planning a stay in the Portland area be sure to check out Mt. Hood Village RV Resort, located just outside of Portland. Mt. Hood offers accommodations in yurts, park models, camping, and RVs. 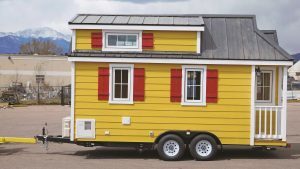 And, for those wondering what it might be to like to stay in a tiny home, the new Tiny House Village at Mt. Hood is available beginning Memorial Day Weekend. Make your reservations today at MtHoodTinyHouse.com or visit RVontheGo.com for more information on Mt. Hood Village RV Resort, or thousandtrails.com to book a reservation at any of our resorts across the US!